Preacher makes a hell of a debut; Wayward Pines and Powers return. Series Debut: The uninitiated have no idea what the hell Preacher is, while the fanboys are convinced that the 1995-2000 Vertigo comic-book series can't be adapted for any screen, let alone basic-cable TV. And then there are the concerns about stoner-comedy duo Seth Rogen and Evan Goldberg as exec-producers, as well as how an epic Heaven-and-Hell struggle will be received as a weekly series (even though The CW's Supernatural has already been mining that territory for a decade). 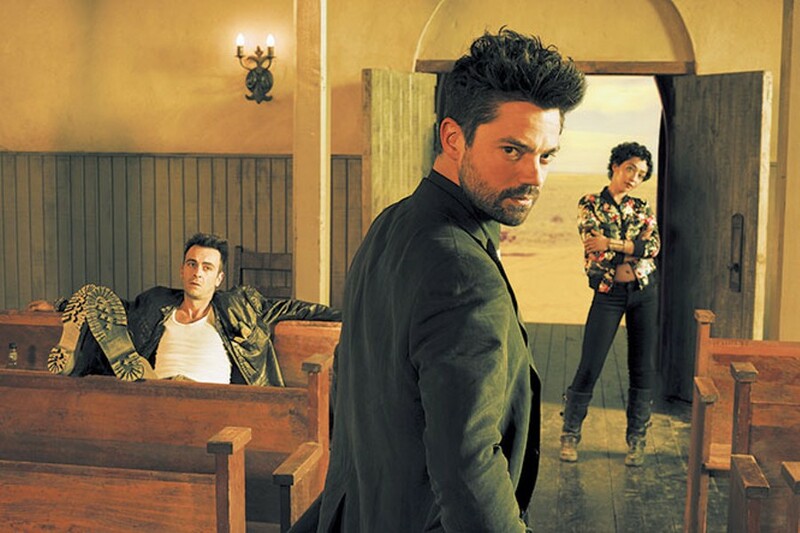 While I can't speak to the fanboys' worries—I've only skimmed the comics—Preacher will definitely blow some newbies' minds with its 90-minute premiere, a violent and funny explosion of sharply written characters (including Dominic Cooper in the title role, nearly obliterating his beloved Howard Stark from the Marvel Universe) and slow-burn exposition (Breaking Bad vet Sam Catlin is running the show here, not Rogen and Goldberg). Is the story of a touched-by-God boozehound Texas minister, his berserker ex-girlfriend, his sarcastic vampire pal and a kid named "Arseface" the next big thing for AMC? Let's pray it is—we don't need another Walking Dead spin-off. Season Premiere: You do realize that you've been watching the same show for 12 seasons now, right? "Bachelorette _______ gets a second chance at true love after her shocking rejection by _______ on the previous season of The Bachelor. With 20 new men [and one quickly ejected psychopath] to choose from, this [blonde/brunette/redhead/vaguely ethnic] beauty is ready find her soulmate and write her own happily-after-after!" ABC has been using this stock press release form since 2003. Season Premiere: Fox Under the Dome-d us. Wayward Pines was supposed to be a one-and-done, closed-end story told in a single season last summer—but then you all actually watched it, probably because I told you to, so this all-powerful TV column is at least partially to blame. Anyway, Season 2 picks up where the first left off, with the residents of small mountain town Wayward Pines now aware that they're the last people on the planet (but has anyone heard from Phil, Fox's other Last Man on Earth? ), flesh-hungry mutants roam the wasteland beyond the forest, and sketchy scientists run their lives—naturally, they're pissed. Jason Patric takes over the Earnest Newcomer role from Matt Dillon, dead Piners Carla Gugino and Terrence Howard appear in flashbacks and Hope Davis continues to shape/manipulate the upcoming generation with a Master Race-ish bent. As with all things connected to Idaho, proceed with caution. Season Premiere: Yes, errybody's in the original-programming game—even your PlayStation. Powers, which debuted in 2015 (Season 1 is currently available on freebie-streaming Sony cousin Crackle), was the first offering from the PlayStation Network (PSN), and it's based on the graphic novel of the same name. The "Powers" are superheroes, though not all them are heroic, hence the need for detectives to investigate crimes and murders associated with them (this universe's superheroes parallel professional athletes and celebrities who think they're above—waaay above—the law). Sharlto Copley, Eddie Izzard and Michelle Forbes return from the first season; Tricia Helfer, Michael Madsen and Wil Wheaton join for S2—that's some serious actor-ly weight for a series streaming through a game console. Now Powers needs to step-up its scripting and action games to match. Series Debut: Remember The Maya Rudolph Show from 2014? A one-off sketch/variety hour that did surprisingly well with viewers and critics alike? Naturally, the geniuses at NBC said, "People liked it, so let's do more of that ... in two years, with a couple of co-hosts, because we can't trust a woman to carry this thing even though she's already proven she can. How's that Taxi Brooklyn show coming along?" Maya and Marty in Manhattan adds fellow Saturday Night Live-rs Martin Short and an unbilled Kenan Thompson to the mix, so it already instills more confidence than the network's previous brain-dead-on-arrival variety attempt, Best Time Ever with Neil Patrick Harris. Like SNL, Maya and Marty will air live; unlike SNL, there won't be an extra 30 minutes of filler no one can explain or justify.